Side effects reported since 2009. What is the best way to achieve weight lost and achieve positive side effects? * Take three major meals daily - breakfast, lunch and dinner. 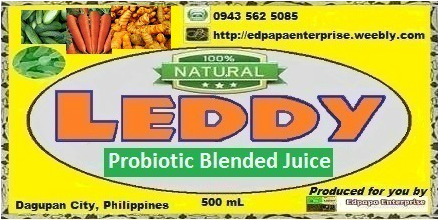 If one meal is not taken, it's alright as LEDDY Probiotic Slimming Juice is able to supplement the moment and will trigger a need to eat if needed. Tastes and smells like red wine, most of the time, it has a kick of dizziness due to fermentation. No synthetic alteration on taste since we want to ensure all-natural ingredients. Ensuring sacrifice is rewarded with utmost positive effects. What is not advised when drinking LEDDY Probiotic Slimming Juice? **** if taking medications, use half shot cup at least 30 mins before lunch and dinner.